"Four years ago, I bought “Mountaintownie Wild Fire” (Dave), just after his fourth birthday. He was quite a weak, wimpy youngster and it has taken time to bring him on slowly. I chose a SMART™ Dressage saddle for him as I had been having trouble getting a traditional treed dressage saddle to fit him. As Dave is very short in the back, I found a treed 17" saddle always sat on his shoulders so that he couldn't lengthen his stride or use his front properly. 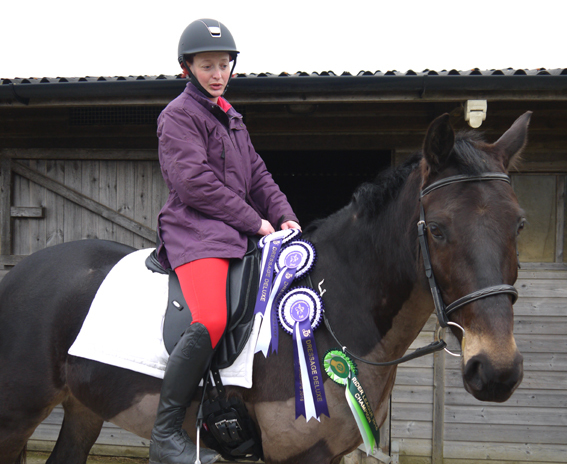 Dave is much happier in his SMART™ Dressage saddle, building up muscle really well. After purchasing my SMART™ Dressage saddle and moving up to Novice level, we excelled ourselves by not only qualifying for the Dressage Anywhere 2016 Online Championships at Intro, Prelim & Novice levels but we also managed to finish with a win in the Novice, a second in the Prelim and 6th place in the Intro. We also won the overall Rider League championship for 2016. I have continued to work with my trainer and Dave at home and, although we have still not managed to get to our first live competition yet, this is my goal before the year ends."